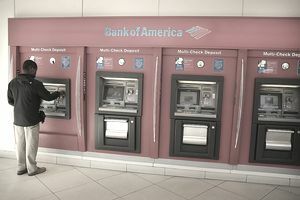 Bank of America has long stood out for offering one of the more advanced ATM deposit systems in the United States, but over the years, the banking giant has made its ATM features even more high tech. With this overview, learn why Bank of America ATMs stand out and why they are so customer friendly. Bank of America is one of the banks that led the paperless deposit trend. These deposits allow customers to drop a check in the ATM without an envelope. Instead, the ATM reads the information from the check, and the customer's receipt includes an image of the check. But if the customer doesn't want that image and receipt, she can opt not to get one. Eliminating the hassle and security risk of paper is the whole point of automation. Previously, customers could not see images of checks deposited at ATMs. But Bank of America made the groundbreaking move of giving customers the ability to do so. It is a step that allows customers to bank when and how they want -- at a lower cost to Bank of America. The new technology gives customers access to a range of services during extended hours to address their daily banking needs, and provides them with convenience, control and flexibility over how, when and where they bank. Using the new ATMs, customers can speak with a Bank of America teller via real-time video and receive the same quality of personal assistance they would if they walked up to a banking center counter. Cash checks for the exact amount, including receiving change. Receive cash withdrawals in a variety of denominations ($1, $5, $20 and $100). Deposit checks with cash back (future functionality). Split a deposit into two or more accounts (future functionality). Make loan or credit card payments (future functionality). While financial institutions such as Bank of America are increasingly adding features to their ATMs to provide more convenience to customers, many people, especially young people, are forgoing ATMs altogether. Thanks to technological services such as direct deposit, Check 21, PayPal and auto debt, it's no longer necessary to visit the ATM. The more services ATMs provide, however, the more likely customers are to take advantage of them, especially if they can drive to the ATM rather than walk up to it. ATMs allowed customers to save the time it would take to enter a bank and wait in line for a teller. Changes in technology may one day mean the end of ATMs.